Kingfisher Airlines Shares Fall 25% In 6 Days ~ " Century Fox Post "
(Century Fox Post):Kingfisher Airlines shares extended their losing streak to a sixth straight day Monday. The stock has been locked down at the lower circuit on each of these days, taking the total losses to 25 per cent over these six sessions. 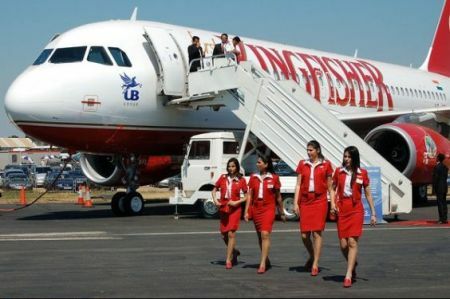 At 11 a.m., Kingfisher Airlines shares were down 4.9 per cent at Rs.12.60 on the NSE. This was in sharp contrast to the other two listed carriers. Both Jet Airways and SpiceJet shares traded with over 1 per cent gains amid broad market weakness today. The debt-strapped Kingfisher Airlines, devoid of a turnaround plan to get back into the air, faces a possible shutdown by the government after extending the grounding of its fleet for another week. The Directorate General of Civil Aviation (DGCA) told the airline late on Friday to demonstrate why its permit to fly should not be suspended or cancelled, and gave it 15 days to reply. The DGCA said the airline had failed to establish a "safe, efficient and reliable service". Kingfisher stopped flights Monday last week after a weekend protest by staff turned violent. Airline employees have not been paid for seven months. The company said in a statement it would submit its response to the regulator "well in time" and would also come up with a plan to restore services after negotiating with employees. Kingfisher, once India's second-biggest airline, has failed to find an overseas airline or other investors to bring in fresh equity. The Centre for Asia Pacific Aviation, which estimates Kingfisher's debt at around $2.5 billion, said a fully funded turnaround would cost at least $1 billion. It said Kingfisher had only an outside chance of recovery and that its "massive debt burden, crippled fleet and poor employee morale" would deter a foreign airline investor. It is now the smallest of India's six main carriers and its steep decline has enabled rivals such as Jet Airways and IndiGo to raise fares in what had been a ferociously competitive market plagued by overcapacity. Kingfisher, controlled by liquor baron Vijay Mallya, has never turned a profit since its launch in 2005 and before this week was flying only 10 planes. Its fleet once numbered 64. Kingfisher's lenders, mostly government banks led by State Bank of India, have refused to extend further credit in the absence of fresh equity, but they have shown patience. Indian state banks rarely force big companies to liquidate. "Banks are still giving time to Mr. Mallya to get an investor. Because if we pull the plug it would be irretrievable. And if we are patient with him possibly there is a chance that he would revive," SBI Chairman Pratip Chaudhuri told reporters. "Having waited for so long we might as well wait longer."